The more Katie becomes immersed, the more she learns the stories of both the upstairs and downstairs, the upper crust and middle of the road. The combustion between classes becomes explosive as the summer tears on. Betrayals, a sexual predator, and a missing person lost in murky waves drive the reader on a racing Learjet through impossible twists and turns before landing at the shocking conclusion. When Katie meets Luke, a marine biologist and teacher, he makes her realize what it is she really wants, as she understands the life she’s begun for herself is built on shifting Hamptons’ dunes. 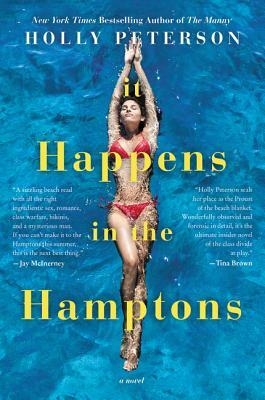 Holly Peterson is the author the May 2017 social satire fiction release, It Happens in the Hamptons. In 2016, she curated an outdoor cooking book, Assouline's Smoke and Fire: Recipes and Menus for Outdoor Entertaining. In 2014, she published The Idea of Him and of the New York Times bestseller The Manny in 2007. She was a Contributing Editor for Newsweek, an Editor-at-Large for Talk magazine and an Emmy Award-winning Producer for ABC News, where she spent more than a decade covering everthing from trials of the century to global politics. Her writing has been published in the New York Times, Newsweek, Town and Country, The Daily Beast, Vogue, Harper's Bazaar, Elle Decor, Departures and numerous other publications.